Several institutes, businesses, and universities are researching the use of bamboo as an ecological construction material. In the United States and France, it is possible to get houses made entirely of bamboo, which are earthquake- and cyclone-resistant and internationally certified. In Bali, Indonesia, an international K-12 school, the Green School, is constructed entirely of bamboo, for its beauty and advantages as a sustainable resource. There are three ISO standards for bamboo as a construction material. 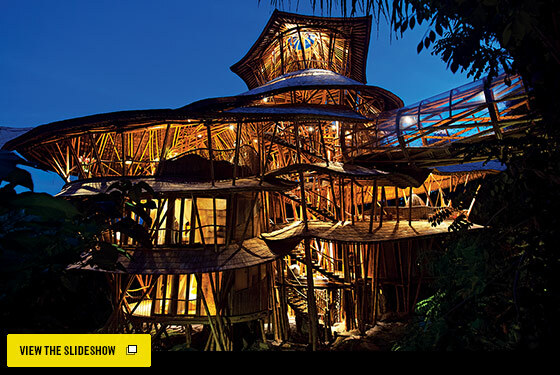 The above house, designed by Ibuku, is part of a community of gorgeous homes built entirely from bamboo in Bali. Construction on the village began in 2010, and it continues to grow with the addition three more fantastic homes this year (and they’re available to rent!). Constructed with locally-sourced materials and traditional building techniques, the Green Village fits in perfectly with the surrounding natural landscape of Bali’s sacred Ayung River. Another Bali interior above creating a beautiful cathedral ceiling. A bamboo Bali treehouse for that magnificent feel. 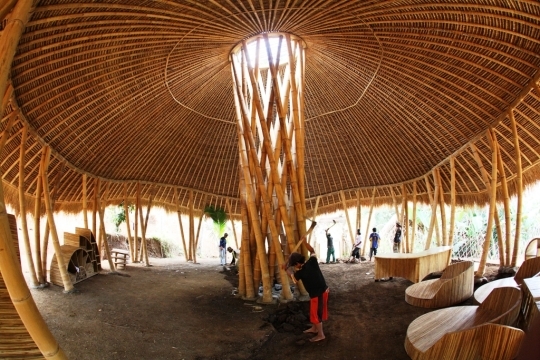 Above is not a house but the Green School in Bali – a very different learning environment. To see more Gold Coast inspired passive bamboo architecture see Gold Coast Bamboo Architecture.